It’s not always easy to get kids (okay and sometimes adults) to eat healthily. In fact, if I am being quite honest, it’s been a struggle for me to get my kids to have good eating habits until the last year or so. Because my kids are active and my metabolism is not what it used to be, it’s important for us to eat healthily. Even more, it’s important for all families to eat healthily. Because it’s something that’s important to me when I heard about 4-H Food Smart Families. I’ve always had a special place in my heart for 4-H since I was a kid. I remember being in the 4-H club and even winning some competitions they had. However, this is a bit of twist, one that I love. 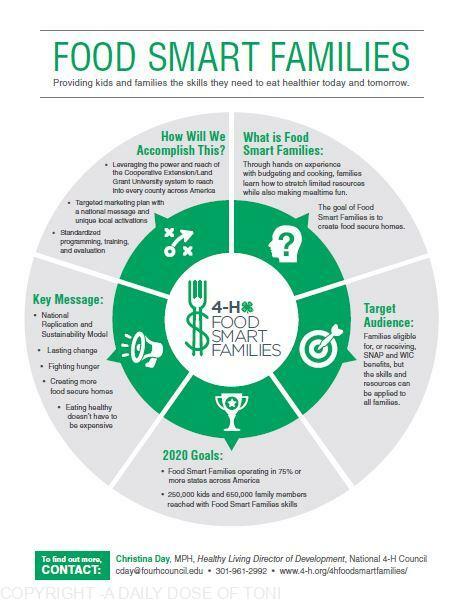 What is the 4-H Food Smart Families program? The 4-H Food Smart Families helps families by teaching them how to plan, shop, prepare and ultimately enjoy healthy meals on a budget. This is so important because nearly 16 MILLION children are in households that are considered “food insecure”, meaning they don’t have a constant access to food through the year. That’s so heartbreaking. They have been partnering with United Healthcare since 2011, to deliver healthy living programs to more than 340,000 youth and their families, in 14 different states. That’s huge! Through the 4-H Food Smart Families, they are using the “Teens as Teachers” model. Teens, over 400 to be exact, serve as role models and mentors to help fellow teens and their families to shop better and cook smarter. Because of the program, 90% of youth participants are more active, 89% eat more meals together as a family, 87% have said their families purchase healthier options and 86% eat fruit vs. an unhealthy snack. To me, that’s a big win for our youth! 2) Dress it up. Let’s face it, if a child sees broccoli their “Gross” sensors go off in their minds. But add a little cheese over it and suddenly it changes their whole outlook. My kids love cheese, so melting cheese and putting it over broccoli helps them eat it. Or if you can’t get your child to eat fresh fruit alone, purée it and make popsicles. They are yummy on a hot summer day and what kid (or adult) doesn’t like popsicles. 3) Be patient. Picky eaters aren’t going to change overnight. So just keep having them try new things, mine hated salads and such and now they love them! It’s boiled down to the rule that you have to try one bite of everything on your plate, even if you’ve had it before” method. If they still don’t like it they can move on, so patience is key! What are some ways you help your family to eat more healthy? These are some great ideas for healthier family eating habits. We also like to shop at the farmer’s market to get the freshest and most affordable local foods. Kids are more likely to try a food if they picked it out themselves and met the farmer who grew it.